The Ulm Pishkun State Park Visitor Center is designed to be a bridge between peoples, cultures, and perspectives. "The buffalo was part of us, his flesh and blood being absorbed by us until it became our own flesh and blood. Our clothing, our tipis, everything we needed for life came from the buffalo's body. It was hard to say where the animal ended and the man began." hike the trails, hear stories, view the cliffs, and capture & behold the panoramic vista of Big Sky Country! For more than 1,000 years, prehistoric men and women of the Great Plains hunted bison by driving them over cliffs. 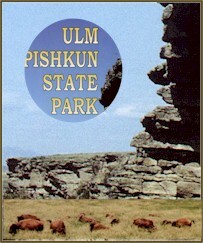 Ulm Pishkun, is possibly the largest buffalo jump in the world, was used as a jump site between 900 and 1500 A.D. Below the cliffs that stretch more than a mile, the soil reveals compacted bison bones nearly 13 feet deep.
" one of the most active and fleet young men is selected and disguised in a robe of buffalo skin ... he places himself at a distance between a herd of buffalo and a precipice proper for the purpose; the other Indians now surround the herd on the back and flanks and at a signal agreed on all show themselves at the same time moving forward towards the buffalo; the disguised Indian or decoy has taken care to place himself sufficiently near the buffalo to be noticed by them when they take to flight and running before them they follow him in full speed to the precipice; the Indian (decoy) in the mean time has taken care to secure himself in some cranny in the cliff... the part of the decoy I am informed is extremely dangerous."